Worcester Philharmonic Orchestra is an amateur community orchestra of 50+ playing members. Create a friendly, welcoming and challenging environment for players. Play music from a varied classical repertoire, including symphonies and concerti. We also perform music from film and stage. Engage both orchestra members and audience in choice of repertoire. Provide a varied and attractive programme for both players and audience. Share our love of music with as wide a public as possible. Encourage up and coming young soloists by providing an opportunity to perform with the orchestra. Support and encourage musicians back into playing, who may have taken a break due to family or professional commitments. 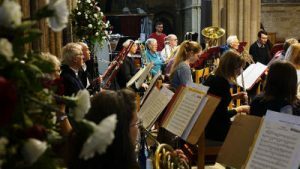 We give an annual series of four afternoon concerts in Pershore Abbey, to an ever growing audience who appreciate the unrivalled experience of live music.